Weaving together hints from the New Testament, Gnostic gospels, and other ancient texts, Mary Called Magdalene portrays the life of the mysterious figure of Mary Magdalene, “Apostle to the Apostles,” and companion to Jesus. Here Margaret George creates a new portrait of one of the most controversial figures in biblical scholarship: a strong, independent woman, given to visions and gifted with a unique faith in Jesus and his message. The daughter of a successful fish processor, Mary is raised in a religiously observant family in the town of Magdala on the Sea of Galilee. As a girl, she finds an idol made of ivory, an image with half closed eyes and sensual lips. Though it is against the strict Jewish teachings against graven images, she cannot resist its power and takes it with her, hiding it from her family. The idol turns out to be a demon, who begins speaking to Mary and then possesses her. Though she marries and has a baby girl, the demons that haunt her persist and multiply, until finally she is near death from madness. Seeking a cure, she leaves her family and small daughter. After a powerful rabbi is unable to heal her, she travels into the desert alone, determined either to be killed by the spirits that possess her, or to mount a final struggle and be rid of them forever. Soon after their victory over her, she comes upon a crowd of people gathered around a wild looking man preaching repentance: John the Baptist. It is here that she meets Jesus. When he commands the evil spirits to leave her, they do, and through this healing she is initiated as his disciple. The book’s depiction of Jesus’s travels throughout the region-with Mary and his disciples at his side-will be familiar to those acquainted with the gospels of the New Testament. Just as in the Gospels of Matthew, Mark, Luke, and John, the Jesus of Mary, Called Magdalene performs miracles such as curing blindness, lameness, and leprosy. George’s interpretation of the message that Jesus has come to share with the world is simple and compelling: The kingdom of God is at hand, and to be prepared one must love God with all one’s heart, worship sincerely rather than just for show, and love one’s neighbors and enemies alike. Assuming her family will rejoice at the good news of her cure, Mary is devastated to learn on her return to Magdala that her family has cast her out, and has no interest in Jesus’s message. Now fully in the realm of fiction-the New Testament offers no details of Mary’s personal life-George’s depiction of Mary’s family’s reaction mirrors the Biblical reaction of Jesus’s own family when he first returns home. Through these domestic conflicts George explores the themes of earthly versus heavenly family, and the necessity of sacrifice in any hero’s journey. Early legends depicted Mary Magdalene as a reformed sinner or prostitute; recently some have speculated that she was Jesus’s wife. Neither has any scholarly validity. George avoids both of these images, depicting Mary as a spiritual seeker and bereaved mother and widow, whose feelings for Jesus inevitably heighten over the course of their companionship, as she struggles with her desire for his love as a man, not just as a messenger of God. That Jesus is unable to offer her the earthly love she seeks compounds her suffering and sacrifice. George portrays Mary and the other disciples not as evolved beings like Jesus, but as mere humans suddenly faced with the opportunity to live a most unordinary life. Though Mary has the gift of prophesy, she fears her visions and the way they set her apart. Her gift-and her closeness to Jesus-inspires some jealously among the disciples, who, despite their faith, continue to struggle with their own pettiness and prejudices about the proper role of women. It is clear that often even Mary would trade it all-her visions and her special relationship to Jesus-to be the simple wife and mother she imagined she would be. Jesus, of course, is betrayed, executed, resurrected, and ascends to heaven, leaving Mary and his disciples to face the challenge of spreading the message without the messenger. Mary spends her life tending to the persecuted believers, always expecting Jesus’s return. For the rest of her days, she struggles with the loss of her family and daughter. A gripping story of one woman’s deepest despair and journey of faith, Mary, Called Magdalene explores themes of dedication and deliverance, the tension between romantic love and love of God, and the necessity of suffering and persecution to test the heart. Torn between her belief in Jesus’s message, and the love for her family, her love of Jesus as a man and her love for him as God, Mary bravely and painfully remains faithful to her heart’s calling to the truth. Through her example, George calls on us to consider life’s biggest questions: what it means to be called by God, and how each of us might answer. The Bible hardly mentions Mary Magdalene. What other primary sources did you turn to for information on this historical figure? How much did you rely on the Gnostic Gospels, specifically the Gospel of Mary? Scanty though they are, the four canonical gospels remain our main source of information about Mary Magdalene. They recount her early possession by demons, her cure by Jesus, the fact that she was financially able to support Jesus’s ministry, that she remained with him during the crucifixion and in coming to the tomb on Easter morning, became the first to see the risen Christ. The Gospel of Mary, discovered in 1896, does not add any biographical information about her; it does stress her spiritual and visionary wisdom, her primacy among the disciples, and her closeness to Jesus. I wanted to bring these elements into the novel. They explain why she became so ‘famous’ among the early Christians, which she certainly was. Further details about her life appear in apocryphal writings in the fourth, fifth, and sixth and seventh centuries, but some of those facts are unreliable. She is also mentioned by church fathers in the early church such as Irenaeus of Lyons, Tertullian, Origen, Pseudo-Clement of Rome, Augustine of Hippo, Pope Gregory the Great. How did you research the historical times this novel is set? Did you travel to the Middle East? If so, what was your experience there? Do you draw any parallels from the current violence in the Middle East to the conflict between the Romans and Jews at the time of Jesus? Many excellent studies on the first century world are available, and in addition I also did seven years of Bible study, that covered 60 of the 66 books of the Bible. I have traveled in Egypt, Syria, Jordan, and Turkey. I lived in Israel as a child, in the 1950s, and have returned six times since then. The last visit in 1999 was specifically to retrace all of Mary’s footsteps as best I could. I found it a challenge to identify all the sites, and Magdala, Mary’s hometown, was particularly hard to find. It was a calm period then, when there was a brief hope of peace. I feel a great similarity between what is happening now in the Middle East and what happened in Jesus’s time: desperate people without leaders who can help them, despair, and fanatics and extremists driving each side further apart, with mounting bloodshed and violence. You can understand how the people put such hope on Jesus, wanting him only to be an earthly deliverer. What drew you to Mary Magdalene as a historical figure? 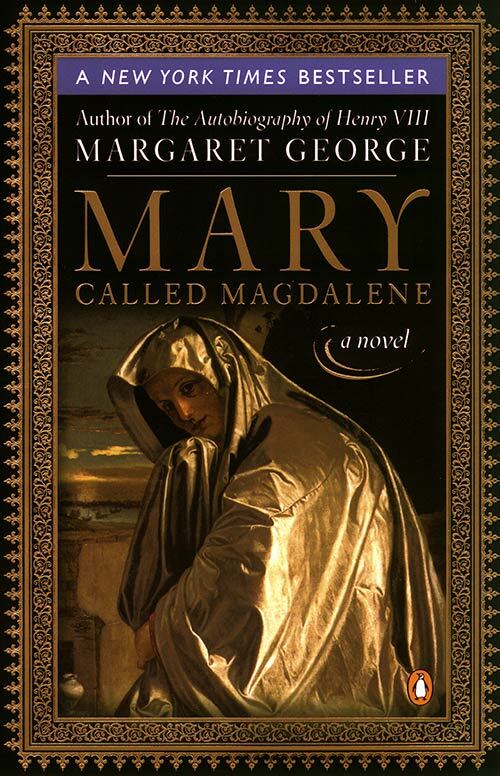 How did the experience of writing about Mary Magdalene differ from the subjects of your other historical novels? Do you personally relate to Mary Magdalene? As poorly documented as Mary Magdalene is, she is more ‘historical’ than many other characters in the New Testament, in that more details are cited about her life, personality and behavior. Many of the disciples are simply names, with no attending facts. Still, compared to my other subjects, she presented much more empty space that had to be filled in by intelligent detective and guesswork. Yes, I do personally relate to Mary Magdalene, as a spiritual seeker who must often chose between two mutually exclusive goals, and as a strong, courageous woman I admire. Past Church fathers have portrayed Mary Magdalene as a reformed prostitute; more recent feminist scholars have portrayed her as a female divinity figure, church leader, and even the wife of Christ. How did you decide on the role you gave her here-neither whore nor bride but beloved friend to Jesus? Modern scholarship has given us new access into the world of the first century, and we are much better at deciphering the meaning behind customs and words than earlier ages. The recent claims that Mary Magdalene was a church leader, based on what we now know about the early church, seemed persuasive to me. Also, the fact that, as one scholar says, ‘She was famous.’ Famous for what? It seems that the Gospel of Mary, as well as some of the other apocryphal, Gnostic gospels, have preserved a hint of what made her so special: spiritual gifts that Jesus respected and that made her close to him. It is not necessary to assert that she was actually his wife. Nowhere in any writings is there any indication that Jesus was married. As for the prostitute label, that did not arise until the sixth century, and it was formally refuted by the Vatican in 1969. So any novel taking that route now would be historically incorrect. The female divinity figure is an interesting perspective, because in spite of thunderings by the Biblical prophets against the rites of Astarte and the Queen of Heaven, people longed for a goddess and missed the female half of creativity. The goddess is a powerful figure who refuses to go away—and that we honor in many ways as she is being rediscovered today. I wanted to bring that out with Mary’s relationship to the goddess idol she found, and which was forbidden but no less compelling. Mary herself is sometimes seen as a Christian version of the goddess, the earthly side representing sexuality and joy, whereas the Virgin Mary represents the ethereal. Perhaps in a twisted way that is why Mary Magdalene was saddled with the prostitute label—the early church had a hard time dealing with sexuality, so any female figure associated with it had to be a prostitute: the origins of the Whore/Madonna split. What is your own spiritual background? A long pilgrimage that has led me from my family backgrounds of Quaker and Baptist, to the traditions of the Episcopal and Catholic churches. I am married to a Jewish man, and now am discovering New Age spirituality. Where does Mary’s longing for Jesus as a husband come from? Is it a residual effect of her demonic possession or rather the understandable cravings of a woman who has lost her husband? I think it is really neither; it is a response to the magnetism of Jesus himself. One commentator has said that Jesus’s greatest temptation could have been the doors his own charm opened to him; everyone wanted him to come to dinner. In such an unusual (for those times) close relationship between a man and a woman, as equals, it would be surprising if someone as human and lonely as Mary did not feel an attraction to Jesus and a wish to have him always with her, as a husband. Why did you have Judas propose to Mary? Are you implying that Mary’s rejection of him had anything to do with his later betrayal of Jesus? I tried to portray Judas as an intellectual who was never able to overcome his cynicism, and which in the end doomed his attempt to follow Jesus. I thought of Judas as the type of person who tries everything to find fulfillment: in his artwork, in his knowledge and learning, in his sophistication. One last remedy had not been tried: marriage and commitment. He reached out to the one other disciple he felt was similar to himself, that he also was attracted to. Perhaps if she had accepted him, he might have posed for awhile as a church worker alongside her, but it would not have lasted. No, I did not mean to imply that her rejection made him reject Jesus, she was just the last branch he tried to grasp before his final fall. Until the every end, even after the crucifixion, Mary doubts. It is not until he is resurrected that she fully believes. Is her lack of complete faith until that moment meant to be understood as a weakness? Or is it an understandable human response to profoundly complex individual. None of the disciples understood what Jesus was about, nor anticipated Easter morning. This is not weakness but common sense, as the resurrection was beyond expectation. Jesus was also mysterious in what he predicted, speaking in parables and strange wordings. I think the last sentence describes it perfectly: an understandable human response to a profoundly complex individual. Are there other women in the Bible you are drawn to or have considered writing about? I always sympathized with Leah, the unwanted wife who had to share her husband Jacob with her younger sister Rachel. (This is in the Book of Genesis.) In competition with Rachel, who was the beloved one, she nonetheless gave Jacob six sons and a daughter—half the Twelve Tribes of Israel. I think the psychological tension in her life must have been phenomenal. 1. Jesus’s family rejects him when they learn his intention to travel and preach rather than run the family business. Mary’s family casts her out when she joins with Jesus. What does this say about the nature of family? Is it possible to find one’s true family outside of blood-ties? 2. The people of Jesus’s hometown of Nazareth do not welcome him or wish to hear his message. Why would the people he grew up with reject him? Why would it be easier to preach to strangers than to long time family and friends? 3. Compare Judas’ conversion (finding Jesus’s answers to be “rational” and “persuasive”) to that of the other disciples. What is the difference between believing with your head and believing with your heart? Does it make a difference? 4. Mary is unhappy that she has the gift of visions and says she would rather be ordinary. What does it mean to live an ordinary life? Given the choice, would she have chosen an ordinary life? 5. Why does Jesus reject Mary’s proclamation of love? Do you think Jesus loved her in the same way as she loved him but felt unable to act on it, or do you think he was truly only interested in her as a spiritual companion? Could Jesus have done what he did had he had a wife? 6. Jesus is persecuted by the Romans, and suffers in death on the cross. Mary is also persecuted, by opponents of Jesus and also by her own family. She suffers her entire life over her separation from her daughter. Is it necessary to suffer? Is that the only way humans are able to deepen spiritually? Could Jesus have spread his message without suffering? Compare his life to the life of Mohammed, who lived to be an old man, and died peacefully. 7. Does a person’s commitment to the truth necessarily mean that he or she will be persecuted by society? 8. There is a desire among Jesus’ followers to make him the King of Israel who will throw out the Romans. Why are the crowds more interested in Jesus as a secular king than a heavenly one? How does this compare to the current struggle for power in the Middle East? 9. The Bible mentions very little about Mary Magdalene. Why would the Bible not mention her more? Throughout Mary, Called Magdalene there is resistance to Mary’s spiritual leadership because she is a woman. Why would men not want a woman in positions of spiritual leadership? What is it that women threaten? 10. Jesus comments that, “There is no way to avert evil,” and later that “John the Baptist’s death is wrong.” What is your understanding of evil? Why would an all-powerful God allow evil, or something “wrong” to occur? Is evil necessary so that we may understand its opposite? 11. People who have visions are discounted as crazy in our culture. If you began having visions, would you believe them? What would it take for you to believe them? Would you give up your own life, your spouse, and your child, if you felt you were being called by God to spread the truth?